It seems, that the HMD position/rotation isn't translated back to the pawn's camera in VR, regardless of the settings. 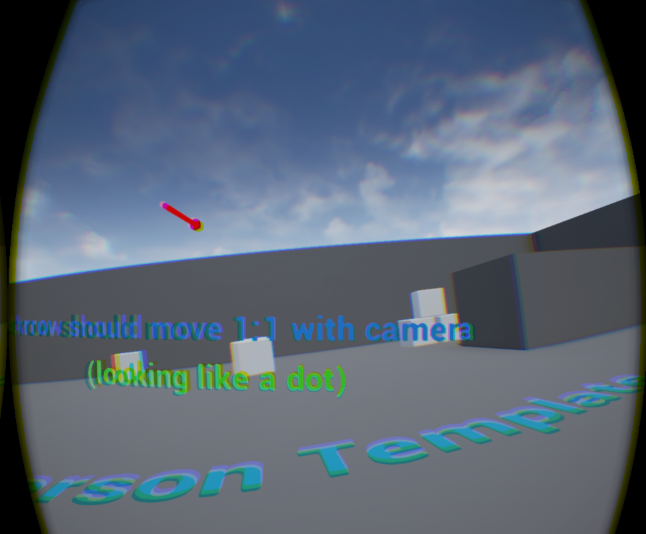 Created a first person test project. As you can see, the arrow and the text don't follow the head movements but stay fixed in space instead. It seems, that there simply is no followHmdPosition exposed which could be set. I am investigating your issue with the node that you have mentioned. However, I wanted go ahead and provide a workaround that I have found that may be viable depending on you needs. I hope that this helps. Here I added a short spring arm so that I would only have to set the location of the spring arm and in turn this would handle the other components. Then I found the middle of the screen and projected outward from there. I Then used this location to set the spring arm location. I believe that this will give you the effect that you are looking for. Many thanks, I will try this out as soon as I can. But it's not only about this isolated case, I have a whole of issues with the pawn's camera not really being the 'real' camera position (the same with the playerCameraManager). But thanks for this particular workaround, might be handy sometimes. I spoke with a developer and you were correct in that the node is not functioning as well as we would like but this is a known issue and is being looked into. Until such time as a solution can be implemented as far as this case goes, I hope that the workaround given will suffice. Starting with the First Person template, and just modifying the FirstPersonCharacter to make sure that nothing in my project is unusual, anything that I attach to the SpringArm lags behind the headset movement. However, with this workaround, the SpringArm lags even with the mouse controlling the camera. Does Event Tick not tick every render frame? Would someone have a barebones FirstPersonCharacter with a working workaround that I could look at, to make sure there aren't any settings that I might be ignoring? Here's what I end up seeing, when I have a SpringArm with a Sphere child. To address the question about the event tick. Event tick is frame dependent and does fire off every frame. However, when you are setting the position of an object. The position will always be one frame behind. The lag that you are seeing is the difference in distance that was traveled between frames. If you would like something that's "stuck" the screen you could try using UMG depending on what it is that you are trying to accomplish. I hope that this information helps. 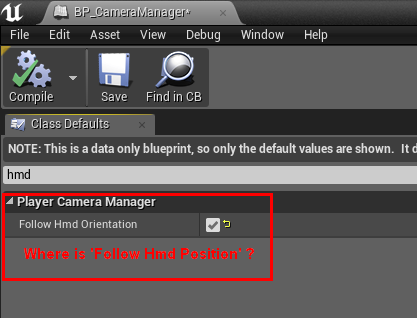 Besides using EnablePlayerCameraManagerFollowHmd of OculusLibrary you also must Enable FollowHmdOrientation on CameraManager (these two actions are different, one modifies the PlayerCameraManager and another one sets flags for the Oculus plugin; I know, ugly, but it was a temporary solution until the proper one is introduced by Epic). After all of this done, you can use GetActorLocation/Rotation from the PlayerCameraManager to set the location/rotation on the SpringArm component. 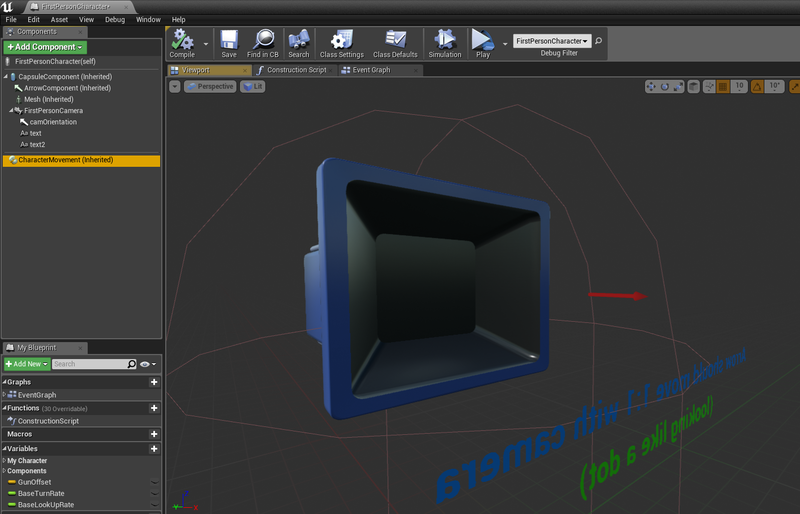 PinToolTip="Sweep Hit Result\nHit Result Structure"
ErrorMsg="Error This blueprint (self) is not a SceneComponent, therefore \' Target \' must have a connection." Fantastic, many, many thanks for making this clear!